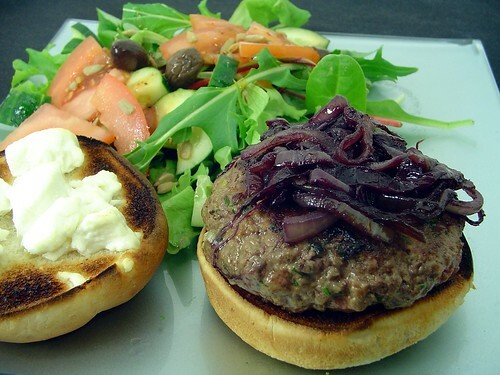 Bison Burgers with Pinot Noir Onions & Goat Cheese – Elly Says Opa! If you’ve read my blog long enough, you know that one of my favorite types of cheese is goat cheese. What you probably didn’t know is that my favorite wine varietal is pinot noir. So, it would only make sense to combine the two in order to make something doubly awesome, right? Right. Pinot noir and goat cheese pair beautifully together, and I often indulge in the combination. After going to a friend’s and having burgers with cabernet onions & cheddar, I thought about how it would only make sense to combine my favorite wine and one of my favorite cheeses (can anyone pick a favorite, really?) into a burger, too. I used bison as the basis of the burger because it’s flavorful but still healthy and lean. Buffalo are always grass-fed, which is nice, since Americans these days are walking tortilla chips, thanks to all the corn byproducts in…err, everything. If you want to know a little more about bison, check out Jenn’s post here. I seasoned the bison pretty simply for a couple reasons: to actually taste bison, and so the onions and goat cheese didn’t have to compete with other strong flavors. I love caramelized onions. Loooooove them. As you know, my palate has changed quite a bit over the years, and one of the things I’ve grown to love are onions. I’m still not a big fan of them raw (a little too pungent for me), but they turn into something completely different when caramelized or roasted. One of the coolest things about cooking to me is how properties of ingredients can shift so much. If you’ve ever whipped a solitary egg white into an entire bowl of meringue, you know what I mean. The hardest (and by that, I mean, most time-consuming) part of this recipe is caramelizing the onions, and you can do that the day before if you want. Otherwise, this comes together so easily and is a nice alternative to your traditional cheeseburger. In a heavy bottomed skillet, heat the oil over medium heat. Add the onions and the thyme. Reduce the heat to medium low and cook with a pinch of salt until the onions are soft golden brown, about 25 minutes, stirring occasionally. Pluck out the thyme sprig (if you used the whole thing…I do that because I’m lazy) and then increase the heat to medium-high. Add the wine and cook until it’s almost completely absorbed, about 5-10 minutes. Meanwhile, lightly mix together the bison, Worcestershire, parsley, garlic and salt and pepper. Form into 4 patties (I like to salt and pepper them on each side, again) and cook them however you like–grill, broil, pan fry (I used my cast iron skillet), about 2 minutes per side for medium rare. Broil or toast the buns with the goat cheese on them. Serve the burgers on the toasted buns with the onions.